I really like this combination, but it’s all up to you to make one that suits you. Cut the the vegetables into small pieces. Rinse lentils and chickpeas well. Put all the ingredients from step 1 in a bowl. Mix and mash well with a blender – to a smooth puree. Put all the ingredients from step 2 in a frying pan, and fry until light golden. Add the white cabbage and let it fry for a few minutes. Have the onion mixture into the bowl with the mashed farce and mix well. Add the carrot pieces. Get the pastry sheets out of the freezer about 20 minutes before it’s time to roll out the plates. Add the farce in the middle of the pastry. 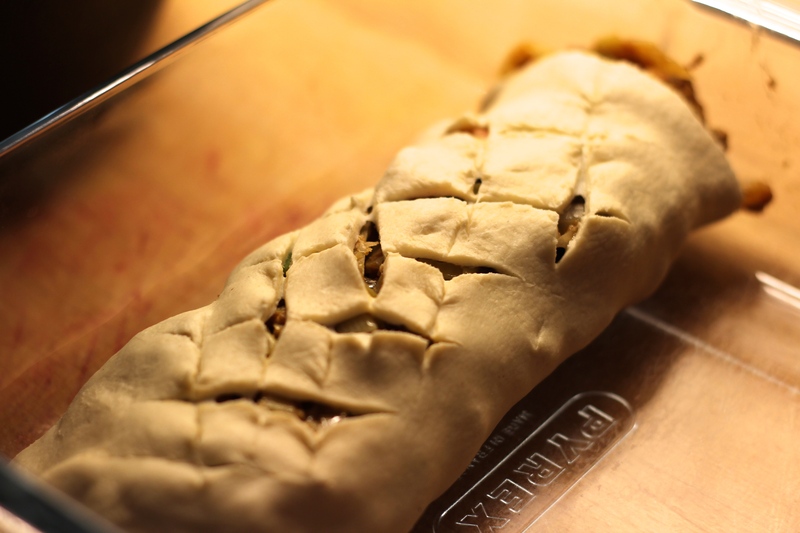 Fold the pastry around the farce on all sides. Turn it with the seam facing down. Use a knife to make checkerboard pattern on the top. Bake at 200 degrees for about an hour, until golden and crispy. Let the roast rest before cutting it into slices.